Since March 2015 a small, multidisciplinary team has been reassessing our understanding of users and the needs for the service design manual. Here's an introduction to what the team is doing. The service design manual was published in April 2013 alongside the (recently updated) Digital by Default (DbD) Service Standard. The manual provides guidance for teams creating services across government and helps those teams meet the Digital by Default Service Standard. A lot has changed in 2 years. Despite its continuing usefulness, we recognise there are problems with the current manual. Among other things making the manual easier to update and navigate will help us capture and showcase the good work being done across government. Naturally we’re interested in seeing how the user needs for the manual have changed. This is especially important in the age of Government as a Platform. A digital infrastructure shared across government needs shared guidance on how to create services that sit on top. We’ve done lots of research to find out about our users and their needs. The whole team carried out discovery research and we’ve been across the country, talking to lots of people working on services, gathering contextual evidence and insights. 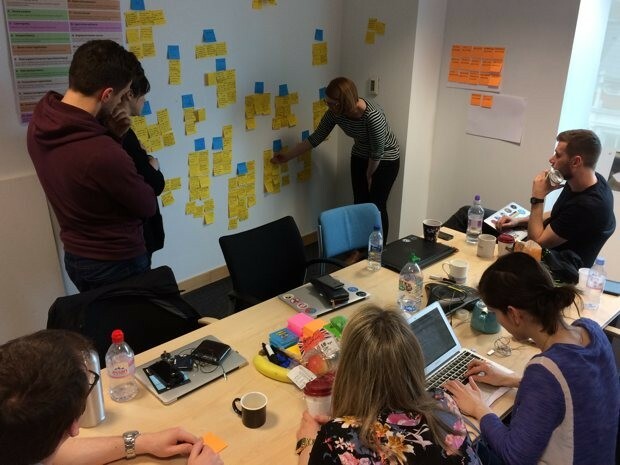 We did this so that we could understand how the service design manual should best support service teams. We also did lots of analysis of the current manual, looking at the analytics, feedback and survey data. We’ve spoken to the people across GDS who own the service design manual content. We wanted to find out about their current experience keeping the content up-to-date, decision making and collaboration. This is so that we can understand how user needs match up to the internal needs of documenting the most recent thinking. We’re now in the alpha stage of the project, testing assumptions and hypotheses by putting prototypes in front of our users. We’re also exploring and testing different governance models for the service design manual content as this is an important part of the legacy of our project. This means understanding how the manual is currently updated and the decision making processes that exists. It also means understanding the scope of the manual and how communities of practice expect to have the discussion about improving its content. Given that we’re a small team, we’ve actively decided not to take on updating the current service design manual. This is still maintained at the same level of service by a network of people across GDS. We want to focus our efforts on understanding how to make improvements, we think this is the most effective use of our time. We’re not taking ownership of the service standard. This is still managed by the service assessments team. The service standard has changed recently, but this is unrelated to our work and is coordinated by the GDS service assessments team. If you’re part of a service team being assessed under the service standard, that will continue as usual and the current manual remains the starting point for guidance alongside specific guidance from the assessments team. We’re expecting to relaunch the service design manual by the end of the year. We will blog about our findings but you can follow the day-to-day progress of the team on our public Trello board. You can also email me or leave a comment below if you’re in government and would like to get involved.